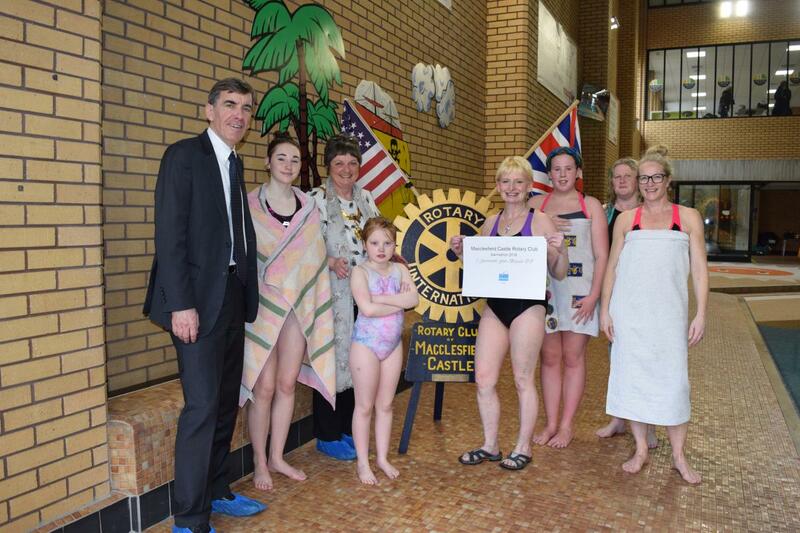 Members of Macclesfield Castle Rotary Club were once again joined by local MP, David Rutley, as well as Macclesfield’s Mayor, Cllr Beverley Dooley, for the Club's annual Swimathon recently. Over 169 individual swimmers from thirty-eight teams took to the water at Macclesfield Leisure Centre throughout the afternoon, swimming a total of 5,811 lengths of the pool, which is equivalent to a total of 145 kilometres between them. The four to six competitors from each team were encouraged to swim as many lengths of the pool as possible in support of local charities, with sponsorship funds split equally between the entrant's nominated charity, and those supported by Macclesfield Castle Rotary Club. This year's Swimathon included teams from the Mayoral charities Space4Autism and Reach Out And Recover (ROAR), as well as local scout and guide groups, schools, businesses and other charities. This was the nineteenth Swimathon organised by Macclesfield Castle Rotary Club, and has raised over £200,000 over that time. Thanks to the generosity of local residents and those who took part, over £4,000 was raised in 2017 to support local and international good causes. Speaking after the event, David said, "The Swimathon has earned a special place in the local Macclesfield calendar, and I would like to thank Keith Dobson and all his colleagues at Macclesfield Castle Rotary Club for their hard work in organising this event. The Swimathon is a great way to have fun and build team spirit, whilst also raising much-needed funds for important causes and I hope yet more local residents and groups will look to take part next year."